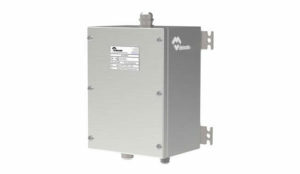 Delvalle Global Solutions presents a new Contactor Atex & IECEx. It is the result of hard work. The AC contactor ATEX & IECEx, is a device designed to control circuits or motor circuits which allow the operation or not operation of the circuit. These contactors can be used in branch circuits to control lighting, heating, appliance, motors and similar circuits. These ATEX contactors guarantee the safety to the technical staff who works with this kind of devices, because these contactors can work with really high currents by low currents. In addition these devices are far from controlled machines, cause of this to work far from these machines is more safety. This contactor has been designed inside of a stainless steel AISI 304L Ex enclosure, type Geoex, specifically designed, waterproof, antirust and with a IP66 protection, allowing us to use it in zones with high explosion risk. This enclosure has a protection “Ex e” y “Ex d” in gas and dust atmospheres. Zone 1, 21, 2 and 22. It’s a really strong and reliable device because it hasn’t fragile components. This Ex contactor allows to control machines from different places, that it means less time spent. It’s possible to add two auxiliary contacts to be able to integrate another circuit simpler. It allows having the motor switching on and off automatized. It protects the internal receptor from important voltage drops. It makes easy the allocation of emergency stop places, blocking the machine switches on, without everything ready. It allows to work with complicated machines and equipment by auxiliary machines, as position switches, inductive sensors, pressure switch, timers, etc. The enclosure can be made of stainless steel AISI 316L.